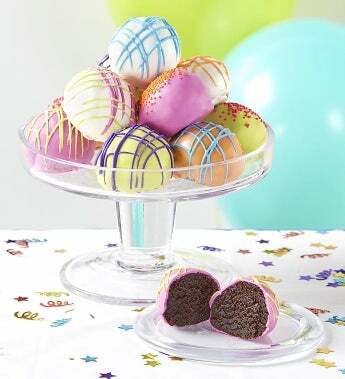 Make their dessert dreams come true with these amazing cake truffles! These oh-so-good treats come assorted in 3 flavors: decadent chocolate, yummy red velvet, and rich vanilla. They are lovingly handmade and hand-decorated by a small artisan bakery. The luscious truffle cake centers are covered with deliciously sweet confectionary icing, then hand-decorated to perfection with drizzle and festive non pareils. You'll make their day with these delights!